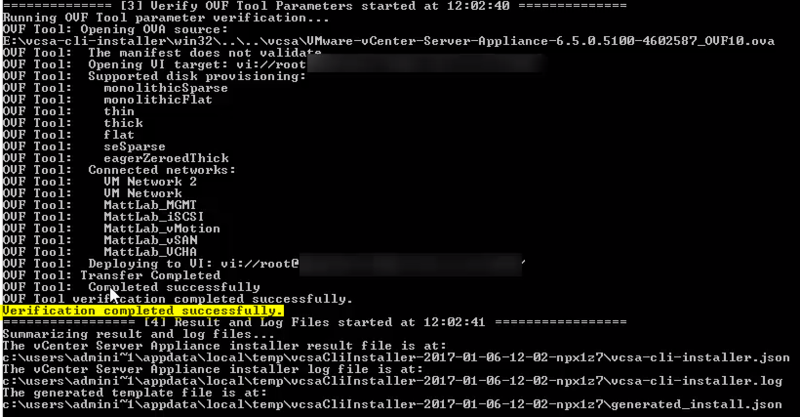 The post below will walk through the deployment of an external vCenter Server Appliance (VCSA) 6.5 node and Platform Services Controller (PSC) to a target ESXi server using the command line interface (CLI) deployment method. For each of the deployment methods I am providing a video as well. 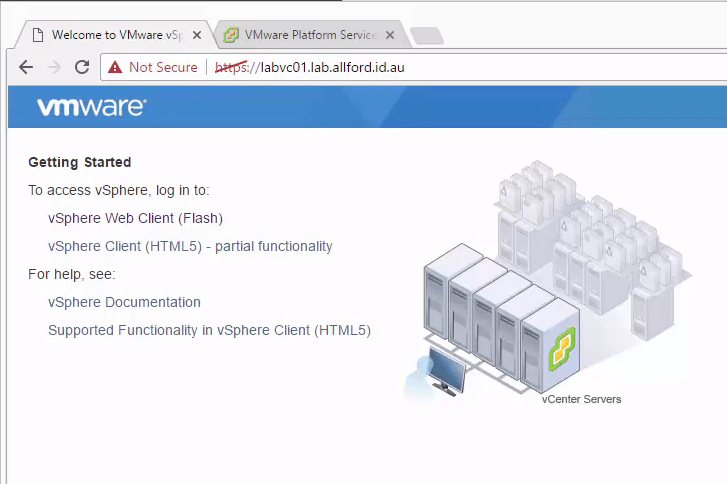 Please find the video for the VCSA External CLI deployment below. This has been recorded in FullHD, so best to watch it in Full Screen! The VCSA can be deployed using either the new GUI installer or by CLI from Windows, Mac and Linux machines. After playing with the CLI a little in the lab, it has become my preferred deployment method over the GUI. A JSON file is used to define the configuration of the node(s) and then a one liner performs the deployment and configuration of the node(s) without the normal GUI “Next Next” trek. The first thing I do before deploying any appliance is making sure there is a DNS record with forward and reverse records. For this walkthrough I’m naming the PSC node labpsc01.lab.allford.id.au (192.168.0.150) and the VC node labvc01.lab.allford.id.au (192.168.0.151). I’m going to copy these files from the ISO into C:\temp so I can edit them. I’ve put the output of my completed JSON files for the PSC and VC nodes below below. I’ve also entered in a section for the NTP server as well, which I recommend you do too. Make sure to put the comma on the line above the NTP.Servers entry and save the JSON file. Now that we have JSON files that specify the configuration of both of the nodes, we can dive into running the CLI utility to verify the data in the configuration file is correct and then move onto deploying the appliances. Run the following commands to perform a verification of the JSON configuration files. 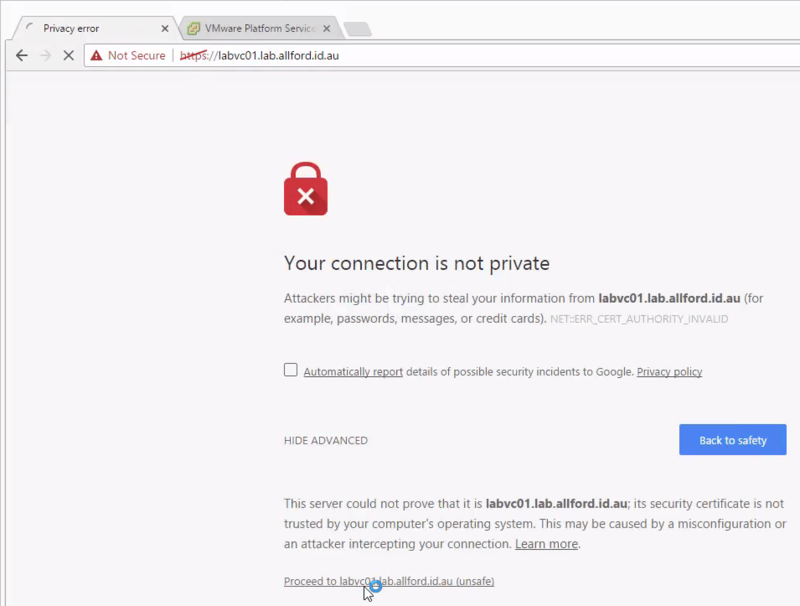 With these switches we are acknowledging the CEIP (–acknowledge-ceip), accepting the End User License Agreement (–accept-eula) and suppressing a warning if the target ESXi node doesn’t have a valid SSL certificate installed (–no-esx-ssl-verify). 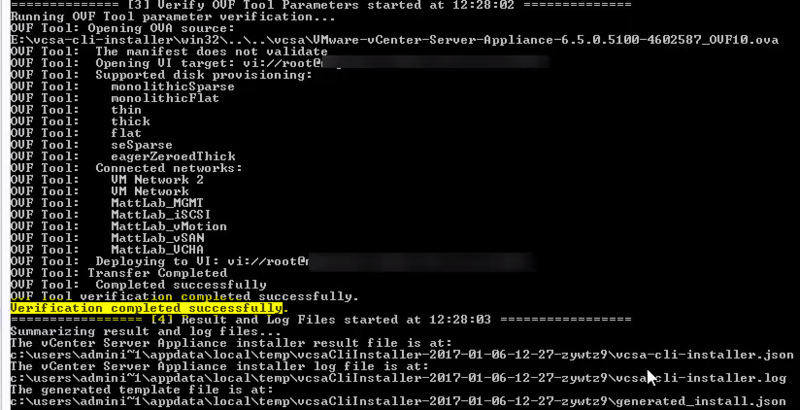 The –verify-only switch determines that we just want to validate the configuration file and the details for the target ESXi node are correct. After running the below, you’ll be prompted to enter the password for the root account for the target ESXi node. As you will see towards the bottom of the screenshot, the verification completed successfully, so we know that the data and ESXi host details we have provided in the JSON file for each node is valid. It’s now time to run the command that will actually do the deployment for us. The commands below are similar to the above, but without the verify switch (–verify-only). This instructs the CLI utility to perform the deployment of the appliances. After running the below, you’ll be prompted to enter the password for the root account for the target ESXi node again. Once these are started, go and grab a beer, as it will take around 15 minutes to deploy, configure and for the services to start up on each node. 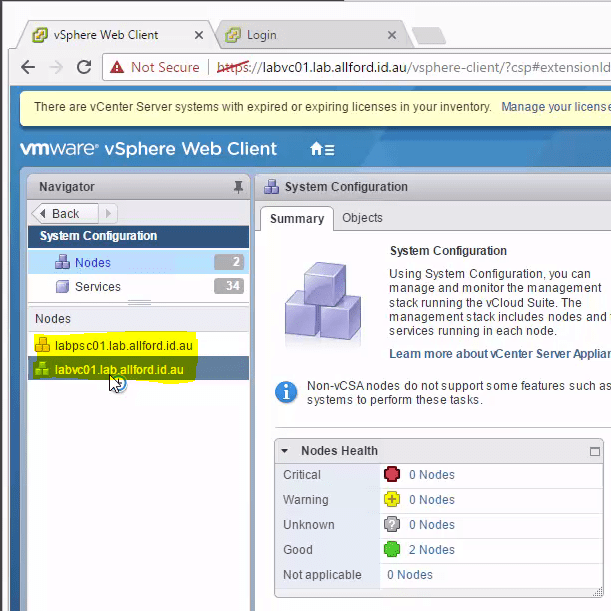 After the nodes have been deployed, we can go ahead and launch a browser to the vCenter Server and log in to the web client, where you can see that in this deployment we have two nodes; a Platform Services Controller and a vCenter Server. 1. If you are deploying multiple PSCs I assume you just run the PSC section a 2nd time (with different IPs and names of course). 2. Have you tried running both of these as a single “script”? I assume the PSC services are started by the end of the PSC deployment, so by the time the vCenter deployment is ready to contact it during install it would succeed? No worries at all. Glad it was helpful! 1. Yes that’s correct, but for the second PSC on wards you need to use a slightly different template. In the templates folder on the VCSA ISO, you will notice there is “PSC_first_instance*” and then “PSC_replication_on*”. When deploying the second PSC (or 3rd, 4th, etc), you need to use the second template of “PSC_replication_on*”. The difference is that these templates have a property of “replication-pertner-hostname”, where you specify the PSC name of the PSC you want this newly deployed PSC to replicate with. I’m a big fan of anything CLI so I find this post extremely informative. I”m used to using the GUI method of deploying vCSA. Will using CLI bring about any advantages? Is deployment via CLI faster than using GUI? It’s probably one of those “it depends” type of things. If you work for a single organisation and don’t find yourself deploying many PSC or vCenter Server nodes, then there probably isn’t a huge operational benefit for you by doing the CLI based deployment over the GUI based deployment. In terms of “speed”, I’d say yes, the CLI based deployment would overall be faster. It’s not faster to deploy the actual machines or anything like that, but within a minute or so you can have a JSON file filled out from the template, kick off the CLI installer and then come back in 15 minutes and you have your machine fully deployed. Deploying via JSON (CLI) also allows you to document that JSON file and you know how your environment was deployed. When I’m doing testing in my lab, I often find myself spinning up 4-6 PSC / vCenter Server nodes for a test environment. The CLI based deployment allows me to spend 5 minutes getting some JSON files ready, and then I deploy the nodes with a simple “foreach” loop in Powershell, come back in an hour or so and everything is spun up for me ready to go. So, as I started with, the advantages come back to what you’re trying to achieve and that will determine if the payoff is worth it for you. I’d encourage you to try the CLI based deployment method and let me know your thoughts on the GUI vs CLI deployment options. It’s a wonder and clear article. Thanks for sharing it. Is there any way we can re-use the template to re-deploy more vCenters ? To be precise, is there any way we can pass some of the varying parameters on CLI , and the rest in JSON, so that we can re-use the same template for additional vCenter deployments to the same vCenter (e.g in cases we want to deploy more embedded PSC/vCenter) ? Appreciate if you can help with providing some inputs in such cases. 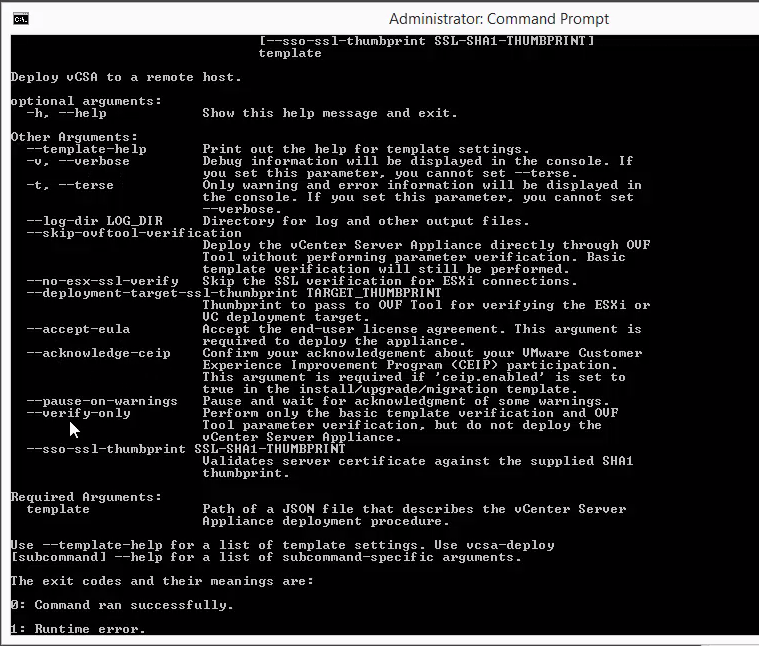 The CLI deploy tool has functionality of “batch mode” which can deploy more than one appliance in a single deployment. It is described more in the following article, does this help? Thanks Matt, The doc has some cool info on deploying multiple vCenters which is useful to deploy external PSC and ELM configurations. Though, that is half of what I needed, the other half is to have control on deployment parameters. 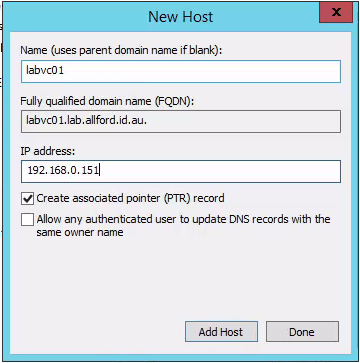 Say, for example, in a lab environment, we’d have most common configuration parameters to deploy multiple vCenters. However, is there a way where we can have just one template for all the common/optional parameters and then provide the remainder varying parameters through CLI; like system.name, ip, appliance name etc. I thought it would be nice if we can wrap a lot of common parameters and re-use the template for varying deployments on the go. Appreciate your time with this. !